On Tuesday St John’s forward JaKarr was named Big East Rookie of the year. Sampson becomes the second-straight St. John’s player to earn BIG EAST Rookie of the Year honors and the third overall. Moe Harkless took home the league’s top freshman honor in 2011-12, while David Russell earned the award in 1979-80. The 6’8 freshman forward from Akron, Ohio won the Big East Rookie of the week award seven times this season. That mark only trails an elite group of freshmen that includes Syracuse’s Carmelo Anthony who won the Rookie of the Week 10 times in 2002-03, Georgetown’s Allen Iverson 9 times in 1994-95 and Notre Dame’s Troy Murphy 8 in 1998-99. Sampson leads all BIG EAST freshmen in scoring (14.9 ppg, 12th overall) and rebounding (6.6 rpg, 12th overall). His rejections (1.2, 10th), defensive rebounds (4.4, eighth) and offensive boards per game (2.2, 13th) are listed among BIG EAST conference leaders. In league play, his 15.1 ppg ranked 12th among all players. Sampson also recorded a team-best 25 double-figure scoring efforts, including seven 20-point performances, and scored a career-high 22 points on two occasions. 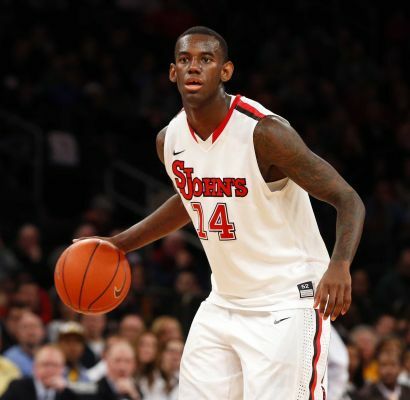 Sampson tremendous season has helped St John’s overachieve in the Big East this season as they were picked to finish dead last in the Big East this season by several preseason publications. Today St John’s who is the number 10th seed in the Big East tournament will play the number 7th seed Villanova Wildcats. This game can be seen on ESPN 2 at 7 PM.